Heat coals or gas grill for direct heat. In large bowl, mix potatoes, bell peppers, onion, olives and tomatoes. Stir in flour, 2 teaspoons of the chili powder and 1/2 teaspoon of the salt. Spoon mixture into large heavy-duty aluminum foil bag. Sprinkle remaining 1 teaspoon chili powder and 1/2 teaspoon salt over chicken. Arrange chicken on top of vegetables. Double-fold open end of bag. Slide foil bag onto cookie sheet to carry to grill. Slide foil bag onto grill. Grill uncovered 4 to 5 inches from medium-high heat about 20 minutes or until potatoes are tender and chicken is no longer pink in center. 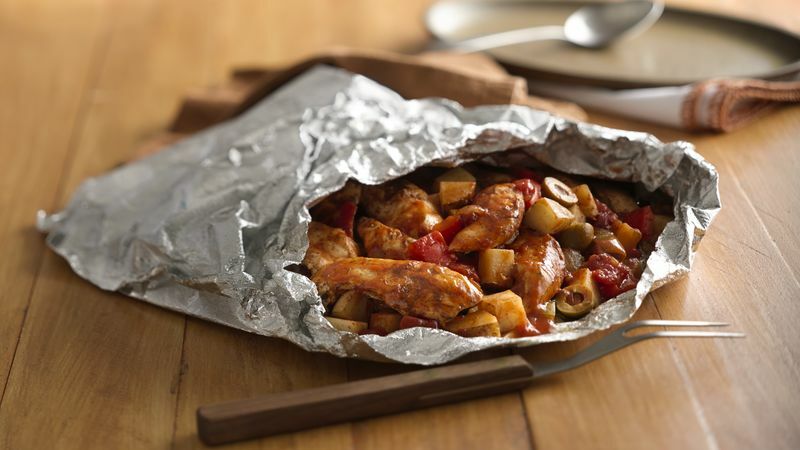 Make your own foil packet with two 18x15-inch sheets heavy-duty aluminum foil. Place vegetable mixture on one sheet of foil; top with chicken. Cover with the other sheet of foil, and tightly seal the edges.